One year after a mid-life refresh, the 2015 5 Series lineup gains standard equipment in the form of a sport steering wheel design, LED fog lights, and smartphone integration via BMW’s enhanced Bluetooth connectivity. The 550i models now offer Comfort Access keyless passive entry as standard equipment. Other changes include the deletion of the Modern Line trim package, a price drop for the optional Night Vision with Pedestrian Detection system, and the addition of a leather-wrapped dashboard as part of the available Executive Package. BMW sells the 2015 5 Series as a sedan and as a 5-door hatchback that it calls the Gran Turismo. Sedans are available in six flavors: 528i, 535i, 535d, 550i, ActiveHybrid5, and M5. Gran Turismos are offered as the 535i GT and the 550i GT. An all-wheel-drive system dubbed xDrive is available on all except the ActiveHybrid5 model. BMW offers 5 Series buyers a choice between six different engines, ranging from a turbocharged, 2.0-liter 4-cylinder engine generating 240 horsepower in the 528i to a turbocharged, 4.4-liter V-8 engine whipping up 560 horsepower in the M5. 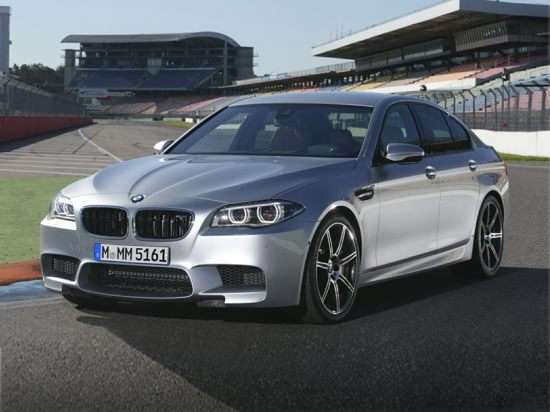 The 535d has a turbo-diesel making 255 horsepower, while the ActiveHybrid5 model pairs a turbocharged 6-cylinder engine with an electric assist motor and a lithium-ion battery to produce a combined 335 horsepower. Manual, automated manual, and traditional automatic transmission are available, delivering power to the rear or, as is the case for models with xDrive, all four wheels. Plus, BMW provides free scheduled maintenance for all 5 Series models for the first four years or 50,000 miles of ownership. Depending on the 5 Series model you choose, EPA fuel economy ratings range from a low of 16 mpg in combined driving for the high-performance M5 variant to a high of 30 mpg in combined driving for the 535d model’s turbo-diesel engine. Among the most popular versions of the car, the 528i is rated to return 27 mpg in combined driving while the 535i gets 24 mpg. Based on official crash-test ratings, the 5 Series is a safe car. The NHTSA gives it a 5-star overall rating, while the Insurance Institute for Highway Safety (IIHS) assigns top marks for crash protection and collision avoidance. However, do note that the IIHS has not performed a small overlap frontal impact test on the current 5 Series models. Every 2015 BMW 5 Series is equipped with black-panel LCD instrumentation, a navigation system, and three free years of BMW Online and BMW Apps services. The car is also equipped with a free 10-year subscription to BMW Assist services with eCall and Enhanced Automatic Collision Notification. Options include numerous infotainment, safety, performance, and autonomous features.